The Robinson R44 is the larger version of the Robinson R22 and can carry 3 passengers. It is equipped with a six-cylinder boxer engine from Lycoming. 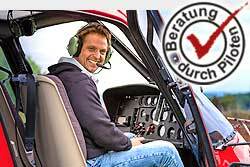 It is one of the most widespread helicopter thanks to its excellent price-performance ratio. The spacious cockpit offers each passenger a window seat and excellent visibility.